We are very proud to share the news that Ngambenyi Primary, our most recent partner school, has been recognised by the local County government as a ‘model’ school and one that they wish to benchmark and replicate elsewhere. Our work at Ngambenyi being recognised in this way achieves one of our major ambitions for our £110,000 project to redevelop the school: that of creating a school that would set a new standard for our own future school redevelopments and lay down a challenge for local authorities and other development partners alike, and show what primary schools, even those in far-flung corners of rural Kenya, can, and indeed, should be like. “I hereby, though belatedly, tender our heartfelt appreciation to you and your organisation, African Promise, for supporting education development in our County. I note with a lot of appreciation that your organisation has built a model school – Ngambenyi Primary in Kasigau – which, as a County, we would like to benchmark and replicate. You have also supported a total of seven primary schools in Kasigau by building classrooms, water tanks and even paying teacher salaries for seventeen teachers employed by the Boards of Management. 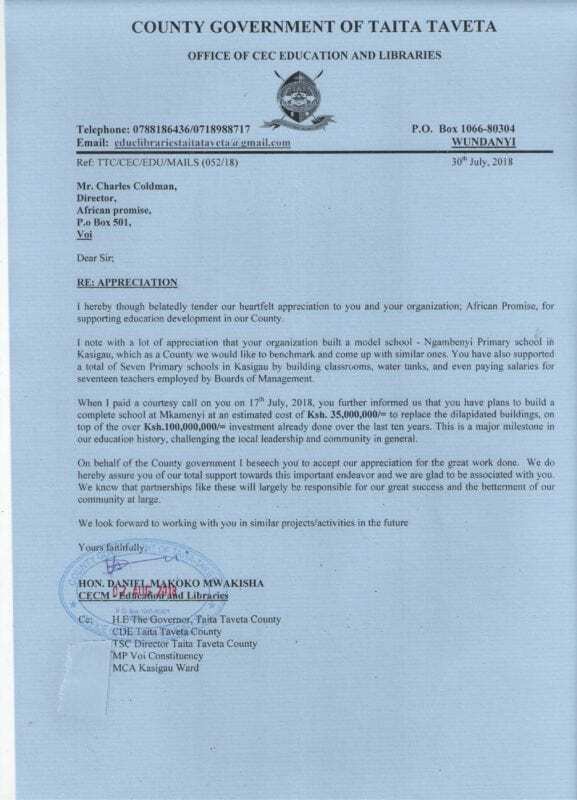 When I paid you a courtesy call on 17th July you further informed us that you have plans to build a complete school at Mkamenyi at an estimated cost of Ksh. 35,000,000/= to replace the dilapidated buildings, on top of the over Ksh. 100,000,000/= investment already done over the last 10 years. This is a major milestone in our education history, challenging the local leadership and community in general. On behalf of the County government I beseech you to accept our appreciation of the good work done. We do hereby assure you of total support towards this important endeavour and we are glad to be associated with you. We know that partnerships like these will largely be responsible for our great success and the betterment of our community at large. This entry was posted in ngambenyi, schools. Bookmark the permalink.